The initial plan was to let CZM finish all her itinerary posts first before ending it with the big question - how much did we spend in total? 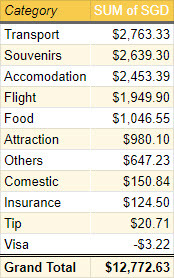 Unfortunately, CZM is getting busier with her work so I shall share the total expenses for the honeymoon trip first. A quick recap - we spent 15 nights 15 days in the United States and 1 day (~7/8 hours) in Japan during the layover. Surprise, surprise. This was actually our highest expense. We rented a Mercedes Benz Convertible for about $2k. The rest of the expenses were fuel, subway, coach/buses, and Uber. We went to 3 different outlets and bought quite a lot of stuff either for ourselves or our family. Brands such as Coach and Kate Spade were having 70% sale due to the Black Friday week. We also went to Google Store and bought some shirt and bag. lol. This includes food items such as Tokyo Banana and CZM's favorite - Shiroi Koibito (白い恋人/白色恋人). We spent about an average of $163 per night. Could have been more but I was able to find and make use of the BRG (Best Rate Guarantee) policy to bring down some of the prices slightly. We tried asking if they can waive the resort fee if we don't need/use the additional services they provide such as Wifi, water, swimming pool, etc. and were rejected. IMPORTANT: None of the hotels provide water kettle. It was damn annoying because we like to boil water (Asian culture?) to drink/make tea/milo or even cook cup noodles (yes, we brought some over). In the end, we always had to go down to the reception/kitchen to ask for hot water and that means giving more tips -.-"
The cost of our flight was relatively lower because we redeemed Singapore Airlines Suites to New York and flew in Economy back. Hahaha. It includes the 15% (lunch) or 18% (dinner) tips. Considering we spent 16 days there and 3 meals each day, I would think it is pretty reasonable? ~$65 per day and ~$22 per meal for 2 people! I think the best/most memorable dining experience would be the Beef Wellington from Gordon Ramsay Hell's Kitchen in Las Vegas! We spent about $176.73 there. Klook is a pretty good place to lower the cost of the various attraction. In addition, it can be combined with ShopBack or KrisFlyerSpree to get more value/lower the cost further! If you do not have an account, can consider checking out our Referrals page :) Unfortunately, we lost money in Vegas! Was hoping we would win back the money we spent in Hell's Kitchen. lol. Random stuff such as data sim card in the United States and portable wifi device in Japan. KPO got slightly lazy and lost track of the cash. lol. We started with US$2,000 cash (exchanged our money in Arcade before the trip, hence the same FX rate) so >80% of the cash was still being tracked. CZM bought Shiseido, Fancl, and Kose. The typical girl stuffs. We bought FWD travel insurance. Tips were mostly given to hotel staffs ($1 each time). I blogged about the mistake we made when we were applying for our visa/ESTA here - Expenses - March 2018. We asked for a full refund and they honored it but due to the difference in FX rate, the bank "gave" us more money. Interestingly, I was monitoring closely but they did not proceed to cancel our ESTA so it became more than free.